Sisters Manisha and Ayesha launched a do-good movement that reuses, recycles and works towards a sustainable life. So, all the T-shirts, kurtas, dupattas, saris or anything that are in your loft can now be artistically transformed. Every once in a while, there comes a time when we step back and start to question our life choices (do we really need all the things from the insane Amazon sale?). For the Desai sisters, it was the mindless consumerism they were surrounded by that pushed them towards thinking that 'there’s got to be a more eco-friendly way'. And with that, they started recycling stuff at their own house, and slowly, friends and family hit them up with things they wanted upcycled. Slowly, the sisters had to expand to accommodate requests from complete strangers, and that’s when this venture-with-a heart started taking shape. It’s a fairly simple process with this brand. You rummage through your cupboard to find sturdy clothes, and they will collect them from your doorstep. 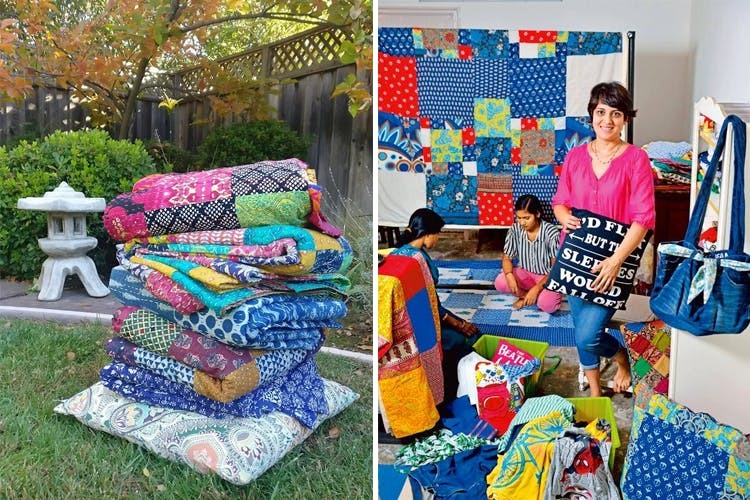 The talented army of women the sisters have engaged in Pune, Maharashtra and Gurgaon then work on your discarded clothes to turn them into quilts, cushion covers, bed covers, baby blankets, buntings and such. If you like, you can actively decide what becomes of the heap of tees you gave, or blissfully leave the ideation of the end product to them. We wish they also had a few readymade options available, but we hear that the folks at Cornucopia are already working on it. They even have a fully-functional website now, so you can easily get an idea of the kind of products they do.